Turkish PM Recep Tayyip Erdogan has urged young Turks to ignore calls to mark the first anniversary of Istanbul's Taksim Square protests. He was speaking ahead of nationwide demonstrations planned for Saturday. Thousands of police officers and dozens of water cannon trucks are to be deployed to the square, reports say. Protests against plans to redevelop Istanbul's Gezi Park last year turned into mass anti-government rallies after a heavy-handed police crackdown. A number of people were killed in the unrest, with thousands more injured. A 64-year-old woman, who fell into a coma after inhaling tear gas during another crackdown on protesters in the capital in December, died on Friday. Media captionGezi Park protester: "I would go back to the park again to protest"
The main organisers behind the Gezi Park protests - Taksim Solidarity - have called for a demonstration on Saturday to mark the one-year anniversary, Hurriyet reports. Demonstrations are also expected to take place in several other Turkish cities, including Ankara, Izmir and Antakya. But Mr Erdogan warned young people not to take part, saying: "One year later, people, including so-called artists, are calling for demonstrations, but you, Turkey's youth, you will not respond to the call." Addressing a crowd of young people in the capital on Friday, he described the movement as "terrorist organisations" that "manipulated our morally and financially weak youth to attack our unity and put our economy under threat". Political commentator Guven Sak writes in Hurriyet: "Gezi was like a litmus test for all of us… Gezi is the "Basta moment" of the Turkish creative class... If you have any doubts about the impact of Gezi, just observe the number of policemen on the streets this weekend... Gezi freaked out the ruling elite of Turkey a year ago and look who is still freaking out. Just count the number of policemen." Intensive security measures are expected to be in place around the capital, with a government ban on gatherings in force in Taksim Square. 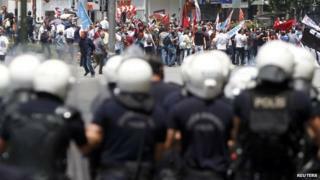 However, Taksim Square will not be surrounded and isolated by police as it was during May Day protests, Zaman reports. Protesters have clashed with police in recent months, with two men killed during angry demonstrations over a mining disaster that killed 301 people last week. Anger also flared in March with the news of the death of a 15-year-old boy who had been in a coma since last June after being hit by a tear-gas canister during a protest. In May 2013, protesters took the government by surprise by occupying Taksim Square and nearby Gezi Park. Riot police evicted them two weeks later using heavy-handed tactics and galvanising anti-government demonstrators in several other cities. Since then, Mr Erdogan has faced accusations of authoritarianism and corruption after a string of scandals. He has also moved to block social media sites YouTube and Twitter, after accusing his opponents of using them to deliberately undermine him. In the first vote since last year's mass protests, Mr Erdogan's party won local elections in March, which was widely seen as a barometer of his popularity.